Once again we have a great case of a smile makeover in Cancun with the help of Snap in Dentures. Snap in Dentures are an amazing alternative to regular dentures and even for All-on-4 if you can’t afford it. Our dear patient Benjamin was given an estimate of $40-60k USD back home to do a similar implant denture procedure but it was simply out of his budget. He instead saved thousands of dollars by getting a vacation in Cancun. He went to relax and have fun under the sun of the Caribbean while he waited for the Snap in Dentures to be done. Best option for me in my budget range. Dr. Cesar, that’s my guy! I also worked with Dr. German and the impeccable staff! I would like to say the foundation of anything successful in life begins with a great nucleus. This office is built on the best doctors but it also has the best staff I have ever had in my life. I felt like they were family. Simply AMAZING!! 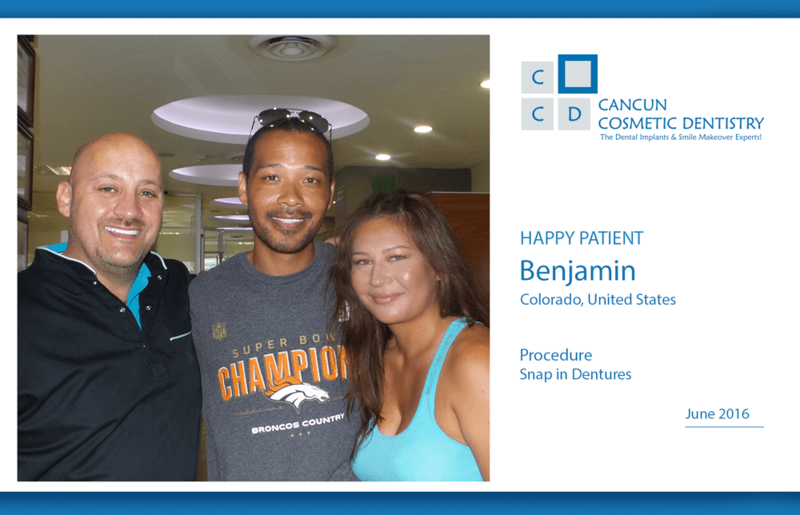 We are so glad Benjamin feels so good about his new smile with snap in dentures. He’s an amazing person and we feel honored to have his trusts. As you can see from his comment above, there was a whole team of professionals looking after him on every step of the way. Doctor German Arzate is not the only professional and experienced doctor we have. As Benjamin mentions, we have Doctor Cesar Ibañez, who is also skilled with dental implants, as well as Doctor Olivia Arriaga and Doctor Yadira Badillo. There are some patients who at first feel let down when Doctor German Arzate is busy with another patient, but their doubts disappear when they meet the rest of the team.